No time for a formal tutorial, my dear readers, but I know you are clever. You’ve got an eye for these things and will certainly be able to recreate this simple project. Are you with me? To make the pod, trim the ends of the 2.5″ x 4.5″ scrap to make kind of a pointy oval, like the photo above. Thread a tapestry needle with a length of yarn and knot the end. Bring your needle up through the pod about 1″ from the bottom point. Thread the 3 felt balls one by one onto the yarn. Bring the needle back down through the pod about 1″ below the top point. Now the next part you can just wing. I took a few stitches down the back of the pod and brought the needle back up between the first 2 peas. Then stitch the front of the pod to draw it in around the peas. Cute! Looks like a little bundled up baby. (a sweet pea!) Bring your needle back down between the peas through the back of the pod and repeat the process. Tie a bow with the red felt strip and tack it at the top. 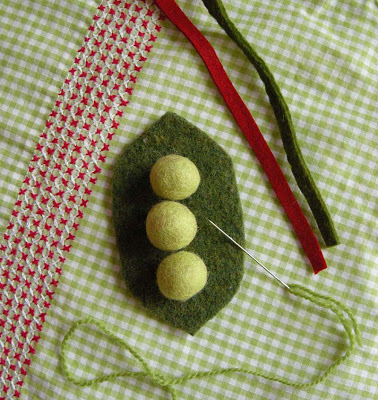 Make a loop with the green felt and tack it on the back. You’re done! Let me know if you have any questions or need clarification. This is my first time in your blog, and I’m so delighted! Wonderful pieces made with love, and your tutorials are great too, thanks for sharing all these! Bye, I’ll surelly be back! Adorable! I’ve been meaning to ask you – what do you recommend for marking felt? For marking felt, I use a chalk liner. A lot of co.s make them but mine is Clover and it’s pen shaped. It has a tiny wheel that deposits a line of chalk powder and it can be brushed away. You are so busy! These are so cute, I wish I had time to get them done for our teachers, heck for ME! Next year…next year. This does beg the question… does the card that goes with them say..
Peas on Earth and Good Will Towards All? p.s. got your book last night.. it totally rocks! Your pea pods are adorable! I love these, you have a way of making super-adorable things with felt. Oh my, the peas are darling!! Oh my! 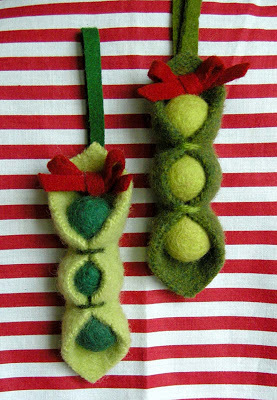 I am making some of these, but out of green beads (I’ll learn to make those balls one day). Thank you so much for the cute idea and the distraction from what I should be doing. Hi! I love the peas! Very strange for Christmas, but I must admit I love them , and they are gorgeouse! Love this idea and all of your things…they are so cute! Quick question…I clicked the link for Martha Stewart to find out how to make your own felt balls, and the link was not good. Could you direct me to somewhere else that has those instructions? Thanks so much! Beautiful work. You are very creative. With apologies for being so late to the party :>) I love these and linked to them on my weekly roundup. Take off the bow or use a different color and they could be used for ANYTHING! Thanks so much for sharing!